It’s so hard sometimes to part with things, particularly furniture. Even if you’ve purchased a new dining room set or just new chairs for your set, you may find it difficult to throw out those old chairs. I’m such a packrat that I just can’t bring myself to get rid of things sometimes, even when they are broken or otherwise seem useless. Well, there’s hope for us hoarders! If you’ve got old chairs that you don’t want to throw out, I’ve found a great collection of projects that will help you turn those otherwise useless old chairs into gorgeous new furnishings for your home and garden. 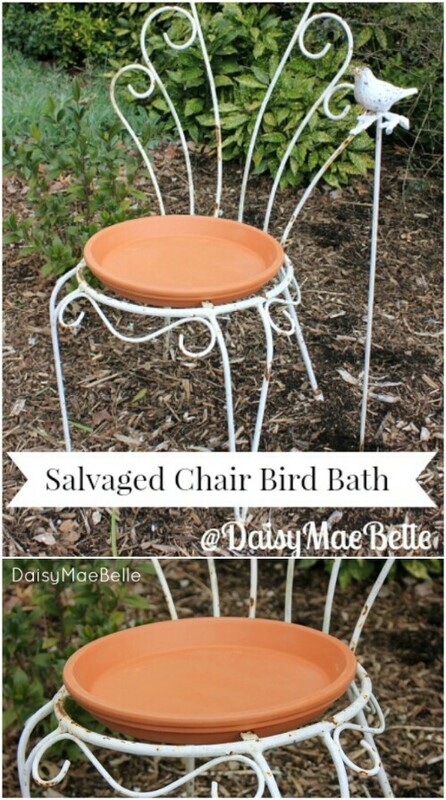 Imagine a great bird bath or even a bathroom towel rack, made from your re-purposed chairs. There are so many options for repurposing furniture! 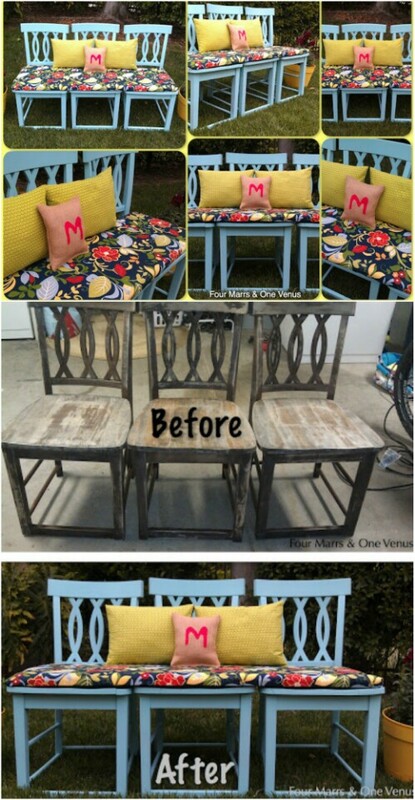 Whether your chairs are actually broken or they’re just a bit weathered, you can turn them into great DIY repurposing projects. These creative ideas are all so easy, too, and will transform those old chairs into useful, functional, beautiful furnishings that you’re sure to be proud to show off. Take a look at the collection and as always, let me know which project or projects you’ve tried. We’ll turn all of those old chairs into great new pieces with this DIY repurposing collection. Those old chairs can be used to create this gorgeous and comfortable outdoor bench. Just like up two or three, depending on how big you want your bench to be, and create a custom cushion that ties them all together. You can sand them down to re-stain or paint, or leave them as they are for a more rustic look. This is a great project for a bit of stylish outdoor seating. 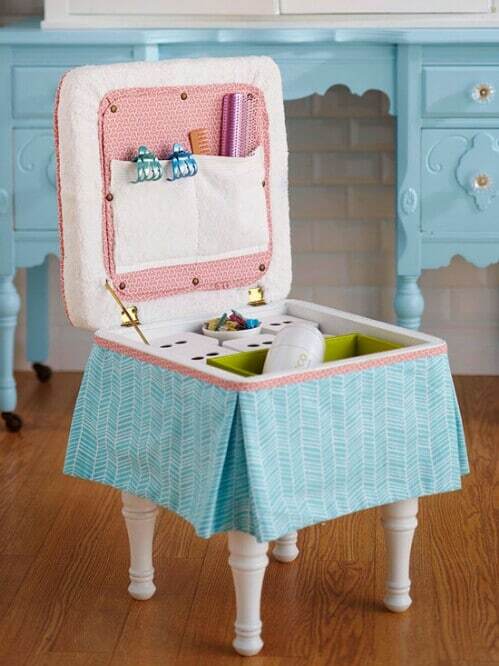 Hair, jewelry, sewing, toys, whatever you need it for, this storage box made from an old chair is perfect. You use the legs and seat from your chair and then add the cushioned top, and liner. This is a relatively easy project, and one that you can finish in a weekend. It’s the perfect addition to your bathroom or bedroom, and you can create as many pockets or sections as you need. 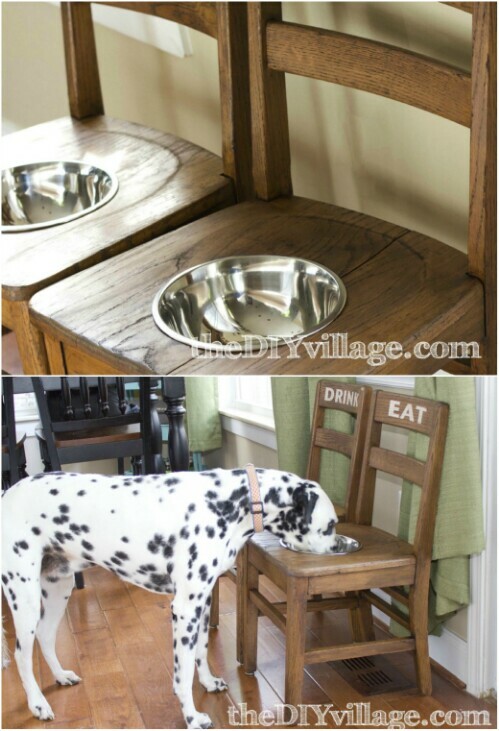 I absolutely adore these chair dog feeders. They’re perfect for taller dogs, particularly when they get older and can’t really bend to their bowls on the floor. You just sand down your chairs, cut out a section in the seat for the stainless steel bowls and voila! You’ve got a gorgeous place for your dogs to dine. These are so easy, and such a wonderful way to upcycle those chairs, and give a little extra-special attention to your furry family members, too! Disassemble the chair just a bit and you can create a really functional, not to mention gorgeous, hall tree. Just add a cushion to the seat and a few hooks to the back and you’ll have room for everything. Hooks give you a place to keep keys, leashes, or even jackets, and the seat is perfect for taking off your shoes when you get home. 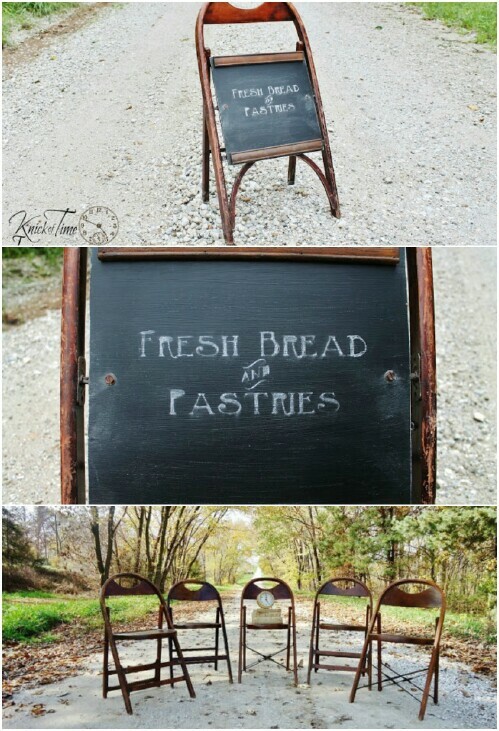 Whether you have an actual business or you just want to add a quaint decorating aspect to your front yard, this sidewalk chalkboard made from a broken chair is perfect. It’s a great idea for weddings or parties, too. You can use a chalkboard or use chalkboard paint if you prefer and create your own board. How gorgeous would this DIY coat rack look hanging in your foyer? 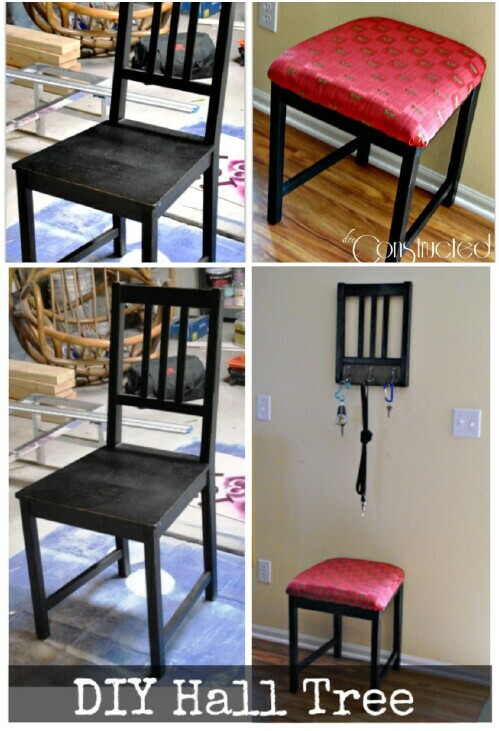 Use the back of the chair, and just add hooks. You can pick up coat hooks at any home improvement store, and you can either stain or paint the chair back, or just sand it down a bit for a more distressed look. Use the entire chair for this bathroom storage project. You can cut the seat down and create two shelves, using spindles or legs for hanging areas. This is a really great idea for kids’ rooms, too. Keep books or knickknacks on the shelves, or add hangers for towels or jackets. Paint, stain, or otherwise customize them whatever color or style you want. Whether you’ve got a huge walk-in closet or you just need something in the bedroom for all those shoes, an old chair works wonderfully. This is the most unique idea for repurposing old furniture, and it’s easy, too. A basket placed in a cutout where the seat goes is perfect for holding all types of shoes, and you can hang them from the back and sides, too. 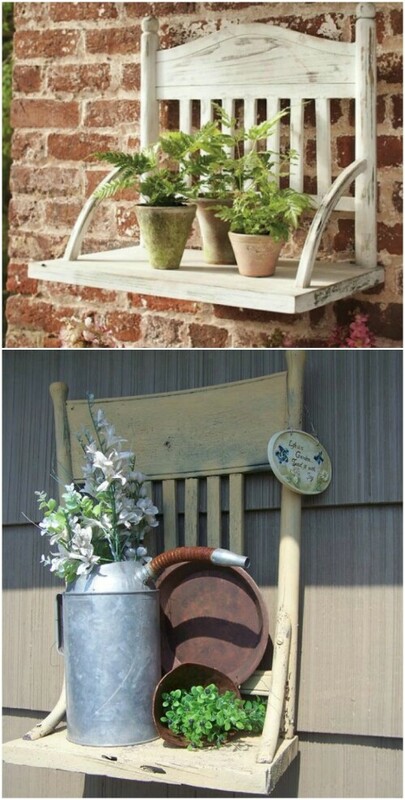 This broken chair turned garden shelf is a wonderful way to upcycle, and you can use this to display plants on your porch or to hold necessities in the garden shed. This is the perfect solution to chairs that have lost their legs, because you only need the seat and back. Repaint and then sand it down to give it a wonderful weathered look. Give those barbecues and outdoor parties a really rustic look with this drink stand that you can make from an old broken chair. This is the easiest project and it’s so unique. You just cut a circle into the seat portion and add your rustic bucket to hold ice and drinks. Honestly, I can’t believe I haven’t seen these everywhere this summer! Such a refreshing upcycle for any chair. 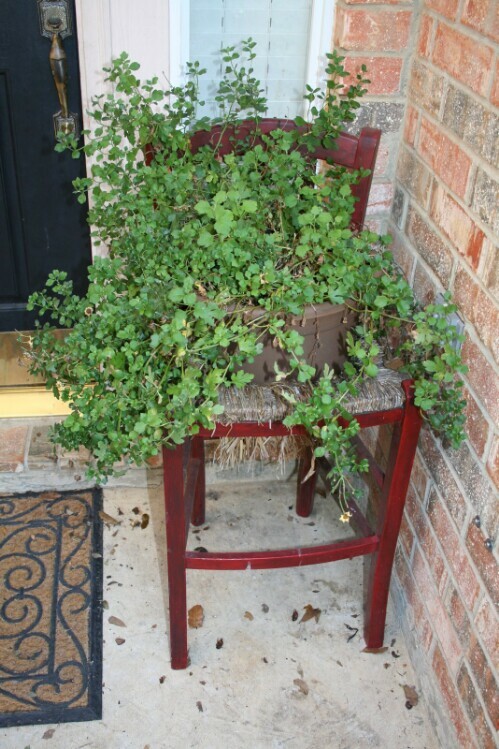 Use that old chair, the one with the broken seat, to create this gorgeous planter for the porch, or even inside if you want. Imagine having one of these on each side of your door! They really give the porch a welcoming, homey look, and they’re so easy to create. 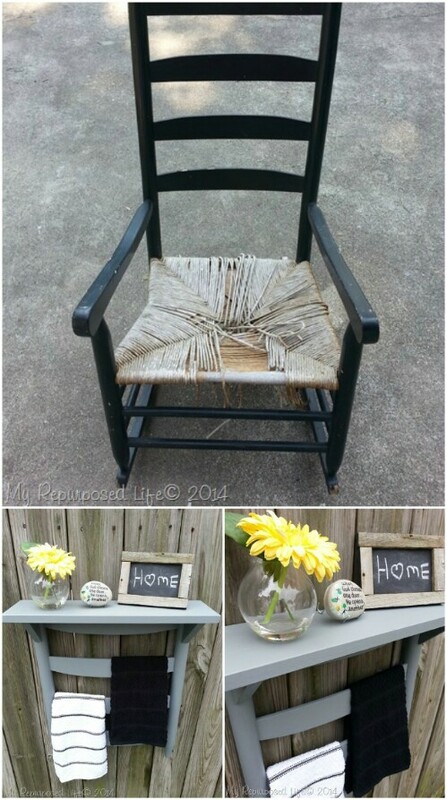 This is an especially good project to upcycle those broken chairs with wicker seats. 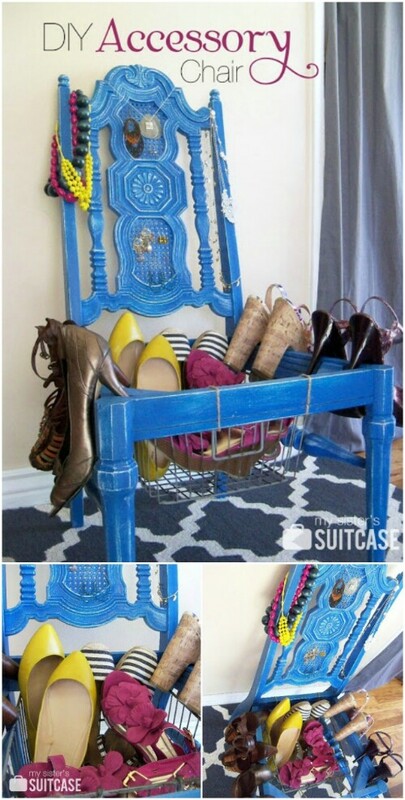 Those old metal chairs can get new life when you turn them into an amazing jewelry storage shelf. 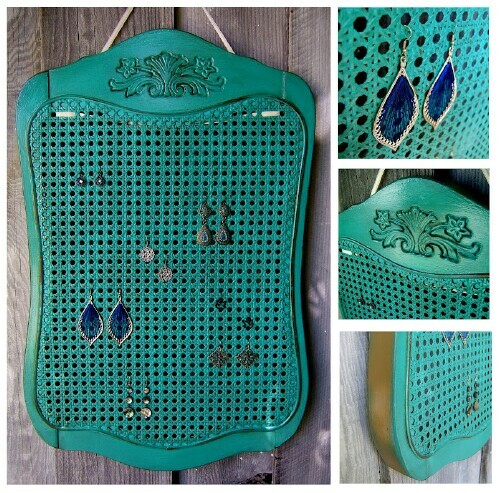 The small holes on the back of the metal chair are perfect for hanging earrings and the entire look is rustic chic. You can paint the chair if you need to match your existing décor, or just sand it down for the weathered look. Remove the chair back, add hangers to secure it to the wall, and you’ve got a gorgeous and really functional jewelry station. 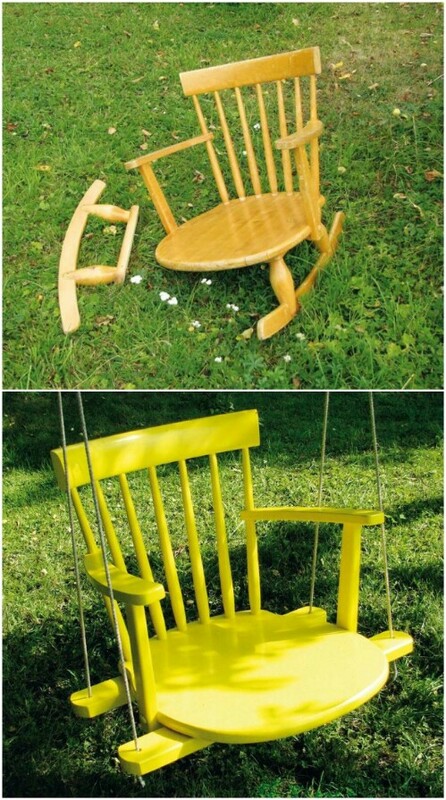 If you’ve got an old wooden dining chair that has broken legs, turn it into this wonderful swing. The kids, and adults, too, will absolutely adore this swing, and if you’ve got a couple of chairs, you can make a swing for the whole family. You’ll need sturdy rope, and you’ll want to choose a tree that’s sturdy, too. Picture frames? Yes! 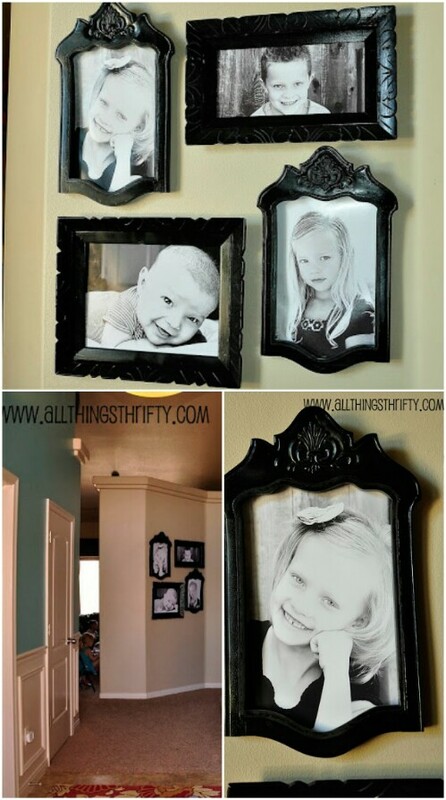 You can use those old chair backs to create beautiful frames to adorn your walls. Now, bear in mind that this one is a bit more complicated, and there’s a little more work involved. It will be worth it, though when you see these gorgeous frames holding your memories. This is a great gift idea, too. If you see old chairs at garage sales, grab them up and get started on this homemade Christmas gifts. Use an old chair to add charm to your front lawn, and give the birds a special place, too. 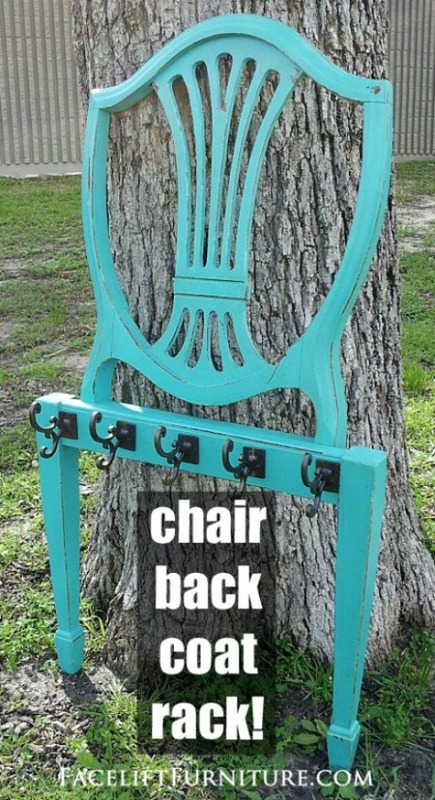 This is perfect for old wrought iron chairs, and is the easiest project. You’ll need to sand or paint the chair, however you want to prepare it. Then just add a terra cotta pot to the seat area and fill the pot with water. Choose a shallow pot for your bird bath. You could add a larger one though if you want to turn your chair into a planter. I have to say, I love this idea. Creating a doggie bed from those old chair legs is wonderful. And, you have most of the chair left to make other projects. This one is really easy considering it’s a bed, and your furry pet will love you so much for it. The bed itself is made from old dresser drawers, so this is a multi-repurposing project. I love how regal it looks! When all else fails, make hangers! You can turn those old wooden chair backs into these amazingly unique and eclectic hangers. You just remove the backs from the chairs, and add the top of the hanger. Whether you use them to actually hold your clothing or you want to decorate with them, you have to admit that these are the most unique hangers you’ve ever seen! 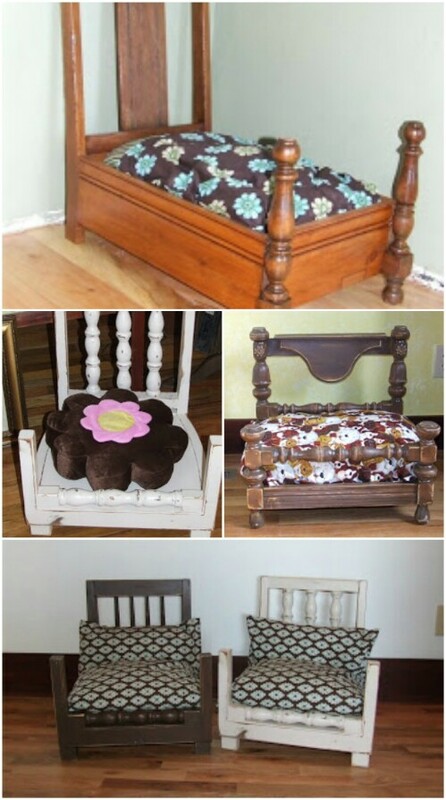 Turn that old furniture into new furniture! 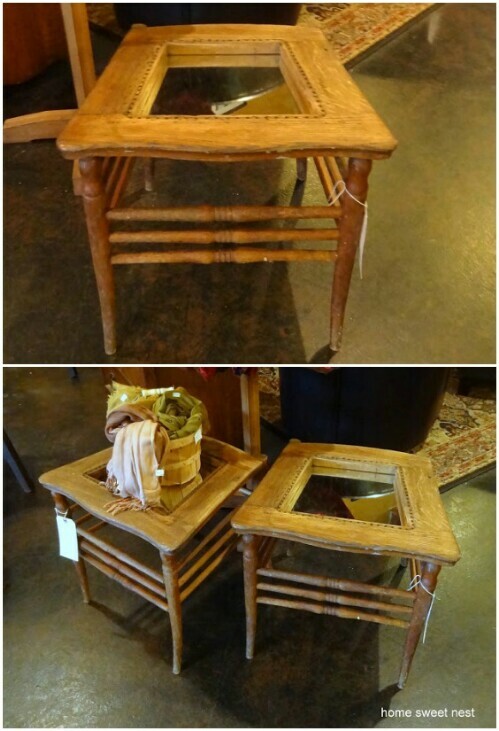 Take those broken old chairs and use them to create these adorable living room tables. Warning – you may get completely addicted to creating furniture after you see how easy this is. You literally remove the chair back and you’ve got a table! You can do a few design elements if you want, but it really is a simple project. 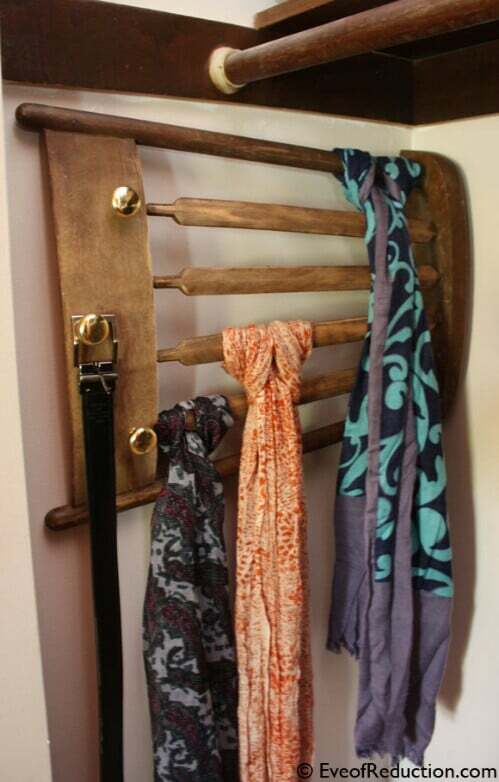 Hang those scarves in style and keep them organized beautifully with an old chair back. This is the perfect project for chairs that have broken seats or legs, because you really only need the back. You just remove it from the rest of the chair, add hangers, and use the spindles to hang and organize your scarves. Add a few knobs for belts or necklaces, too and really get that closet organized. Okay, so if you have a chair that you just can’t part with, but you don’t want anyone sitting on it because of a broken leg, you can turn it into a wonderful picture display without altering the chair at all. 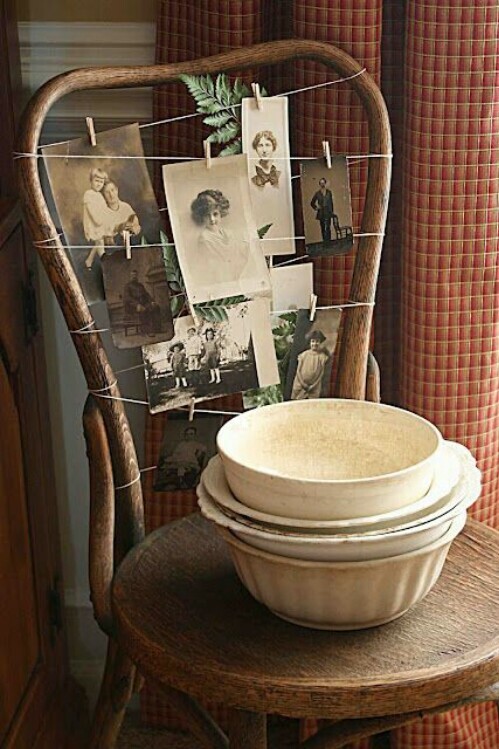 Just string some line across the back and use small clothes pins to hold your pictures. You can add a centerpiece or plant to the seat, too if you want. Excellent to see that woodprix has new instructions to save my money and energy to build it.